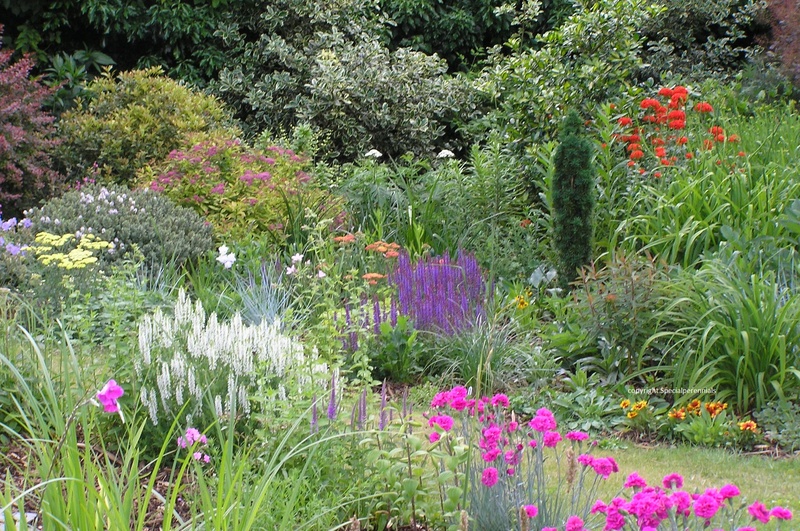 Perfect Partners: Salvias Schneehügel (white, lower left) and May Night (blue, centre) contribute to this June planting in our garden The bright pink Dianthus Devon Wizard and scarlet Lychnis chalcedonica also contribute the fresh-coloured scene. A very large and varied genus of plants that includes the culinary herb sage as well as exotic tender plants from the new world. They grow in a wide range of conditions, soils and situations: there is a Salvia for everyone! Care instructions are covered under each variety. Most Salvia flower in flushes. The tender, New World types can flower throughout the winter in a warm conservatory or heated greenhouse. Winter conditions can also influence how early flowering starts. For example, after a mild winter S.elegans can start flowering in late May, but after a cold winter when it dies back to its underground root stock, flowering might not start until late July. See each type as growing conditions vary. 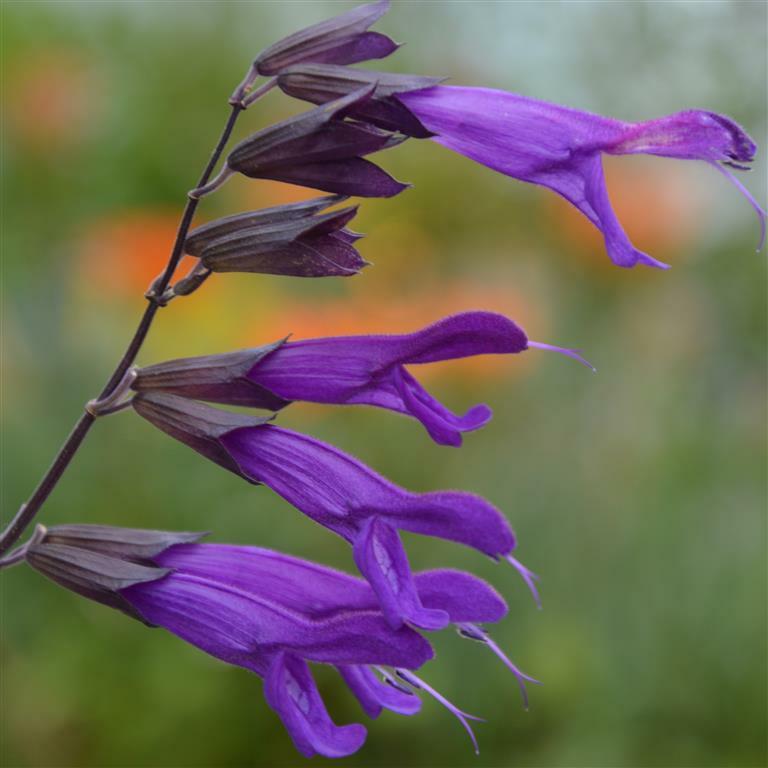 Salvias vary in hardiness and winter care is covered for each variety, but please bear in mind that it is not only cold but wetness that can kill a plant over winter. Many Salvias are very cold hardy but this is because they are covered with a blanket of snow in winter that keeps the roots dry. Others withstand cold winters in mountains which again present very different conditions to the garden. In our details we state how hardy the plants have proved to be in our garden. Most can be propagated from cuttings, seed (for species) or by careful division. The only pests that trouble them in our garden are capsid bugs which make blackened holds in the topmost leaves leading to distorted growth. Not a major problem and damage growth can be pinched out. I don't know of any organic preventive measure; we use a systemic insecticide if really bad damage is occurring. Lovely plants with rough, slightly aromatic leaves and spires of usually blue or purple, hook-lipped flowers from mid summer onwards right into October and beyond in mild areas. They grow from tubers and can be treated a bit like Dahlias - I leave mine in the ground over winter in my free-draining soil but you can dig them in early winter, pot up (don't store dry) and keep frost free and very slightly moist. About 2ft 6in to possibly 3-4ft tall (depending on variety) in flower. They seem to like sun or very lightly shaded spot and moisture in summer. Propagate by careful division of tubers, cuttings or (if patient) seed. Royal purple flowers on 3-4ft 90-120cm tall stems. Mulch the crowns in winter. Flowers July-October. Dark blue flowers and black calyces make a bold and dramatic impact in the border. About 3-4ft tall in flower. July-October. From central Europe and western Asia where it grows in wooded areas (hence nemorosa). They are very hardy and long-lived. The main flowering starts in late spring / early summer. When the first flowers fade cut back to just above where the side buds are forming and continue with this until all the side shoots are spent. Then cut the plants back hard and then more flowers will grow to come out in late summer / autumn. Although they come from wooded areas they do like some sun and in the cool, less sunny UK climate they may sulk in a shady spot. Propagation is by division, normally in spring. Named varieties will produce very variable seedlings and for example, seedlings of Caradonna almost always lack the dark stems that make their parent so attractive. There is some confusion over whether some varieties are truly from Salvia nemorosa, or are hybrids: x.superba or x.sylvestris. I am using the names in the RHS Plant Finder. Salvia nemorosa Amethyst makes a lovely cottage garden plant but the straight stems can also add a more formal, architectural feel to a planting. Perfect Partners: Amethyst is in complete harmony with the near-white pink of Valeriana sambucifolia from mid June through July. Taller than other nemorosa varieties - 2ft 9in. Pale violet flowers make it rather unique amongst this type of Salvia. Blue blue flowers backed by reddish calyces. 1ft 6in / 45cm. Fully hardy. Violet blue flowers set off admirably but the striking black stems. 1ft 6in / 45cm. Fully hardy. (Mainacht) Indigo blue flowers with a tiny white eye from mid May onwards. 2ft tall. Perfect Partners: Purple Rain is the perfect foil for pale pink flowers like Phlox Discovery. Wonderfully tactile bottle-brush flowers with whorls of purple-backed blue-purple flowers. About 2ft - 2ft 6in. Main flowering period is June - August and then again at the end of September if cut back when first flush fade. A favourite with bees in our garden. From the original Wendy's Wishes a whole series of colour breaks is now available. These plants won't be ready until May. A new hybrid Salvia that came up in the Australian garden of Wendy Smith. The pink flowers paired with the pink calyces really turn your head. We saw it growing at Abbeywood Garden in Cheshire and just had to try it. It seems to be hardy in a sheltered spot and free draining soil. Will get to about 2-3ft tall but can be pinched out in spring to keep her more compact. Flowers all through the summer.